Ben Affleck has won 2013 DGA’s Award for Outstanding Directorial Achievement in Feature Film for Argo, further sealing its status as best-picture front-runner at this year’s Oscars. Saturday’s prize also normally would make Ben Affleck a near shoo-in to win best-director at the February 24 Oscars, since the Directors Guild recipient nearly always goes on to claim the same prize at Hollywood’s biggest night. But Ben Affleck surprisingly missed out on an Oscar directing nomination, along with several other key favorites, including fellow Directors Guild contenders Kathryn Bigelow for Zero Dark Thirty and Tom Hooper for Les Miserables. Ben Affleck’s Oscar snub has not hurt Argo and may even have earned it some favor among awards voters as an underdog favorite. Argo has dominated other awards since the Oscar nominations. “I don’t think that this makes me a real director, but I think it means I’m on my way,” said Ben Affleck, who won for just his third film behind the camera. The Directors Guild honors continued Hollywood’s strange awards season, which could culminate with a big Oscar win for Ben Affleck’s Argo. The guild’s prize for best director typically is a final blessing for the film that goes on to win best-picture and director at the Oscars. 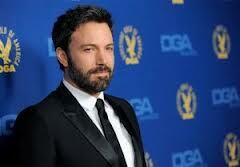 Ben Affleck can go only one-for-two at the Oscars, though. While Argo is up for best picture, the director’s branch of the Academy of Motion Picture Arts and Sciences overlooked him for a directing slot. Backstage at the Directors Guild honors, Ben Affleck said he had nothing but respect for the academy and that “you’re not entitled to anything”.